... swords. I'll never ask for more than that from life and it appears that someone has listened to some extent. Forgetting the rather lame 1985 Red Sonja pic, starring Brigitte Nielson and Arnold Schwarzenegger, which was released by MGM to dismal box-office numbers; last year, Dynamite Entertainment launched a new Red Sonja series that has gone on to be one of the best-selling indie comic books on the market. 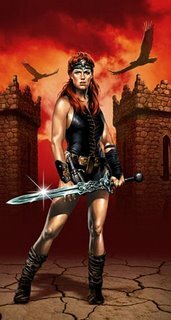 Noting it's success: Avi Lerner and Danny Dimbort's Millennium Fims and Emmett/Furla Films have picked up the film rights for a new Red Sonja film to bring her back to the big screen. Millennium will finance and produce the movie with Emmett/Furla. The project's budget is north of $25 million. Red Sonja, created by sword-and-sorcery legend Robert E. "Conan the Barbarian" Howard, was introduced into Marvel's Conan the Barbarian comics in 1973 and soon was given her own title. Have to admit theres something about a woman in skimpy armour with a large sword (ignoring the fact most women would be unable to move with that lot on)! Ah come on Vaughan, it can only be an improvement, no? "It's a machine...." ... don't you have the DVD, Colonel? I formally deny having Red Sonja on DVD. Anything you don't have means your just waiting to get it since you have "everything". Delta Force 2: The Colombian Connection- I mean really...? Whoa- you have a problem with Chuck Norris- you take it up with him. I don't want that mans aggro down here. Have you read the facts about him recently? I know a couple of people who have "Chuck Norris facts" tshirts. Colonel, are you admitting that you fear Chuck Norris? The man can slam a revolving door! You don't mess with that. I thought that a seasoned vetern of many a risk campaign such as yourself would admit respecting Mr. Norris but to come out of the closet and admit fearing Mr. Norris!. I never lie to anyone. You'll only get the truth here! This "truth" you speak of. It's indigenous only to your reality isn't it?